At Bethlehem, we want to help our students learn life skills as well as spiritual formation. We have gathered some of our greatest cooks from the church and community to help instruct our students in all things cooking--from planning a menu to serving the dish. Week One: The students learned to can tomatoes, make spaghetti sauce and salsa, helped pick and sort the harvest from the garden, and feasted on their home made spaghetti. A little bible lesson was sprinkled in analyzing the individual, unique creation that God made with tomatoes, cucumbers, peppers, and even us. 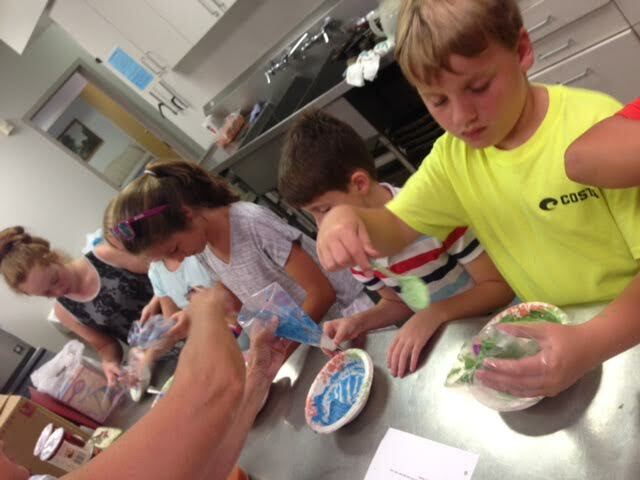 Week Two: The students learned to make icing and decorated their own cupcakes; they also made chili and helped make their hot dog lunch. In addition to their meal, they learned proper place settings for both casual and fine dining. For the bible lesson, the students learned that their age did not matter--they could still be an example to others. Week Three: The students learned to make bread from scratch as well as a healthy pancake mix. Their lunch was a traditional breakfast with fried potatoes, sausage and pancakes. For the lesson, we discussed the need to avoid the "yeast of the Pharisees" which only seeks to build up; instead we are to be like real yeast, which gives itself away and improves the bread.